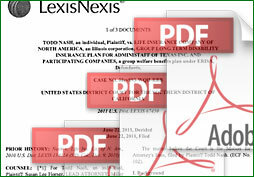 Read Tom’s published and LEXIS-available cases. In 1974, Tom was hired as a law student at the Firm to temporarily fill in for an ill law clerk. Tom has been with the firm ever since. After finishing law school, Tom was hired by the firm as an attorney. Tom’s practice developed primarily in the field of ERISA law, which was passed in 1974. Tom, along with his partner Susan Horner, has handled numerous ERISA litigation cases, many of which are published. His practice has since grown to include trust, probate, and estate litigation as well as general civil litigation. Tom Monson was recently featured in San Diego Attorney Journal as the Attorney of the Month. 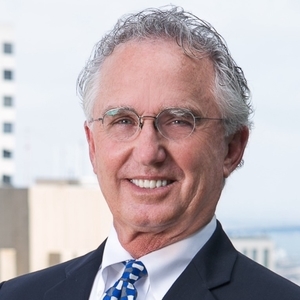 To learn more about Tom’s career in the legal field and his work in the community of San Diego, click here. Mr. Monson was the President and General Chairman of the Century Club and the Farmers Insurance Open for the 2012 tournament and has been a member of the Century Club of San Diego since 1995. The Century Club of San Diego is a non-profit corporation organized for the main purpose of administering and promoting San Diego’s annual PGA Tour event, the Farmers Insurance Open. The net earnings of the corporation are used solely for charitable and philanthropic purposes. The Century Club hosts a world class PGA Tour events to maximize support for the San Diego Community and local youth programs. The Century Club was founded in 1961 and is now in its 57th year, having risen over $25 million for local charities. Mr. Monson has also served on the Ronald McDonald House Golf Charity Committee, the Boys and Girls Club of Greater San Diego Golf Tournament Committee, and the Palomar College President’s Golf Tournament Committee. Mr. Monson was Chairman of the Spectator and Information Committee during the 2008 USGA US Open at Torrey Pines, for which Mr. Monson worked every day from 4:30 a.m. to 10:30 p.m. for 8 days, which Mr. Monson says was worth it because it ended up being one of the greatest US Opens ever and put San Diego in the world-wide spotlight as a place to be.